It's my first giveaway post! Well, duckies, it's that time of year. I'm determined to keep my workload at 40-45 hours per week and NO MORE. Since I was a bit sick last week and it was my Saturday to work I ended up making up hours on Sunday and essentially worked all weekend. Then I looked at the calendar for the next two weeks and basically had a panic attack. So. I'm taking the blog off my plate for a little bit--don't worry about me if I disappear for a few weeks. My goal is to just take the rest of June off and come back in July, but we'll see. In order to share how much I appreciate all of you who read my words here, I have a giveaway! 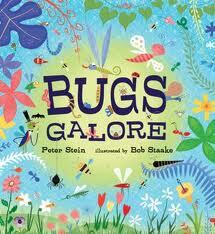 I have a copy of "Bugs Galore" by Peter Stein and illustrated by Bob Staake (LOVE Bob's illustrations, which you may have gathered from my homage in felt) I received this copy for free by reviewing it for School Library Journal, but I'm going to share it with you. Just leave a comment and tell me why you like to read this blog. Your comments will fortify me during the C-R-A-Z-Yness of summer. You have until July 1st to enter the giveaway contest--good luck and see you soon! Love all your felt props and storytelling ideas. As a public school librarian with pre-k and k students...I need all the ideas and inspiration I can get!! Thanks so much for reading, and for your kind words! That was my New Year's resolution - no more 10-12 hour days without breaks. No more working straight through the weekend...I didn't keep it, but I've been doing better! I keep looking back at my notes from last summer to remind myself that THIS summer is soooo much easier, despite all the craziness. So true! This year is definitely better. Good luck keeping things at acceptable levels! As a storytime librarian, I need all the ideas I can get. You have wonderful ideas and I love the flannel boards ...they add something special to storytime. Your blogs and ideas keep me going. Some days, the creative juices just refuse to flow and I'll read one of your posts for inspiration. Try to slow down just a bit (if you are successful, let me know how you did that)and good luck with your summer. I stumbled upon your blog last year while finishing up my masters of library science program when a professor of mine insisted we subscribe to at least 3 blogs. He had his suggestions, which were fine, except just not me. I wanted to follow a blog of someone I could relate to, someone who could relate to me, and someone who had good, practical, real world, useful, creative ideas and advice. Viola! Lucky for me I found Future Librarian Superhero. Your blog inspires me personally and professionally, and I look forward to every post. I know you have a full plate and it’s not easy what we do, but your honesty and resourcefulness energizes me and reminds me that I, too, can help make a difference. So, from me to you, thanks for all you do! Thank you Tamie! Your comment came at a particularly good time--I needed those words.